It's a very different world out there that is a couple of decades ago. Women have always ridden motorcycles, but is hasn't been until recently that SO many women are deciding to sit on the front of the bike and steer their own course! Today, nearly one out of every ten motorcycle owners is a woman! This fact is changing the look and feel of motorcycle riding. Twenty years ago, if you had stepped into a bike shop, you'd find a bunch of guys hanging out, tinkering with their big, black Harley's. The shop would be set up to attract the attention of men. It wouldn't necessarily be clean, and it wouldn't have a lot of gear to choose from. There was a particular look and feel to motorcycle riding and it looked a lot like the men who rode. Today, a bike shop might have an altogether different look and feel. The shop might be cleaner and brighter, with few men with wrenches hanging around. One side of the shop might be dedicated to women's bikes, and there will be more colors on that side to choose from. There might be an entire section of riding gear, in bright fluorescent colors for style and safety. There might be a variety of helmets to choose from, many of which are brightly colored. There might even be a few women hanging around the bike shop, ready to help you with any problems you have or to sell you a bike! There are no firm reasons for this change in the bike ownership trend, but many people speculate that it has something to do with women making their own money and having more disposable income for themselves. With women no longer dependent on men for their spending cash, they are freer to follow their own dreams and desires. Having that money gives many women the confidence they need to do something that used to be considered daring or risque. The motorcycle culture has change as well. No longer is it only a group of bearded men riding hogs, rolling through towns causing trouble. Women have their own motorcycle clubs, their own motorcycles, and their own culture. That culture is as varied as the women who ride. It's not all about the babes that sit on the back anymore. It's about serious women who are enthusiastic about riding and exploring new things. According to the Motorcycle Safety Foundation and the Motorcycle Industry Council, the median age of women who own motorcycles is 42. The majority of first time motorcycle buyers are between the ages of 35 and 50. Many speculate that this is because women of this age have finished raising their children and they are out to do something for themselves. In many cases, this is something they've wanted to do for a long time! A large percentage of these women hold college or professional degrees and are married. Fully one-third of the people who take motorcycle safety courses now are women. This may be a surprising figure, but not to industry insiders. They've seen this coming for many years. Manufacturers such as Harley Davidson have begun to tailor their sales tactics toward women. 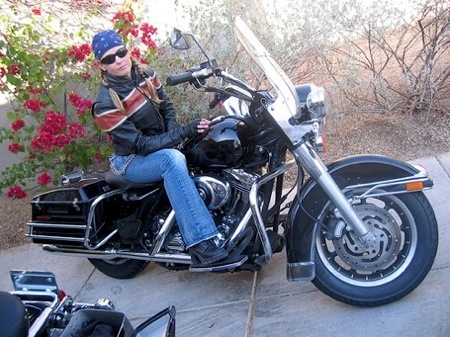 Harley holds "garage parties" for women only, where issues particular to women are addressed. These concerns range anywhere from the fears women might have about riding to which bikes are best suited for women. Women are becoming more and more involved in motorcycle riding and this change is changing the look and feel of the sport. Many more women are feeling confident and secure enough to take up the sport and to be successful. Motorcycle riding is fun and it is for everyone!